Chris Froome, shown here at 2017's Tour de France, has been cleared of doping by cycling's governing body. The Union Cycliste Internationale said in a statement Monday that WADA informed it that "that it would accept, based on the specific facts of the case, that Mr Froome's sample results do not constitute an [Adverse Analytical Finding]." The UCI has now decided to close the proceedings against Froome. "I have never doubted that this case would be dismissed for the simple reason that I have known throughout I did nothing wrong. 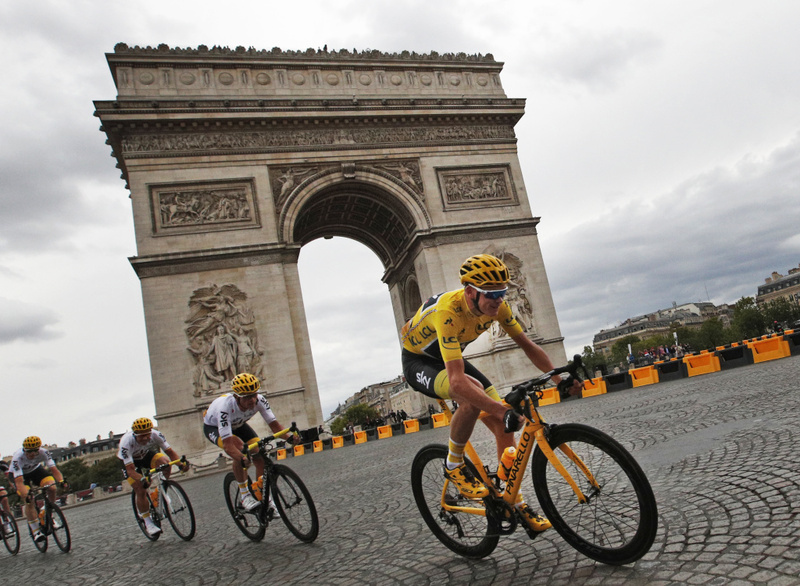 I have suffered with asthma since childhood," Froome said after being cleared. "I know exactly what the rules are regarding my asthma medication and I only ever use my puffer to manage my symptoms within the permissible limits." Froome, who is British and a member of Team Sky, won the Giro d'Italia race in May even as his cycling future was up in the air. "Whilst the UCI would have obviously preferred the proceedings to have been finalised earlier in the season, it had to ensure that Mr Froome had a fair process, as it would have done with any other rider, and that the correct decision was issued," the UCI stated. It added that it received WADA's response on June 28 and then made a decision "as quickly as possible." During the investigation, Froome filed an "explanation for the abnormal result," the UCI said, "together with significant additional expert evidence." Team Sky principal Dave Brailsford said in a statement that "there are complex medical and physiological issues which affect the metabolism and excretion of Salbutamol. The same individual can exhibit significant variations in test results taken over multiple days while using exactly the same amount of Salbutamol." He added: "We have always had total confidence in Chris and his integrity." This follows a report in Le Monde that the Tour de France organizer, Amaury Sport Organisation, had taken steps to block Froome from participating in the race. "It is unclear whether the ASO can — or will — appeal the UCI decision to the Swiss-based Court of Arbitration for Sport (CAS)," according to The Associated Press. Froome, for his part, is viewing the matter is closed: "Today's ruling draws a line. It means we can all move on and focus on the Tour de France."